Hello and congratulations! You have found me (Reverend Philip)! I am a full time wedding officiant and passionate about joining couples in love and honored to perform your ceremony. I do legally perform all Non-Denominational and interfaith ceremonies accepting all religions and spiritual beliefs for weddings in Pennsylvania, New Jersey, New York and Delaware. 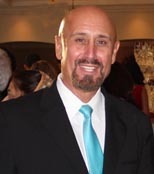 Affiliated Minister with “The First Church of United Fellowship”. Member of Saint Andrews Lutheran church and choir. Clergy director for “Two Heart One Love” wedding Officiants. Tae Kwon Do Black Belt Master: Awarded 4th Dan Black Belt December 1994.